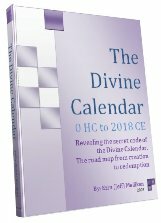 ﻿In our last article we discussed how both the Celsius and Fahrenheit temperature scales aligned perfectly with the specific structural design of the Future Holy Temple as laid out by Ezekiel thousands of years ago, and moreover how the Kelvin scale and the surface temperature of the planets aligned with the dates given by the tzaddikim for the final redemption. Given that, and returning the the freezing point of water, 32 degrees Fahrenheit, we see that the major structural dimensions of the Future Holy Temple centers redundantly and concentrically on the 32 Paths of Wisdom that comprise the Tree-of-life. As we lay out this structure for you in a 2-dimensional grid, please note that the Temple, like the Tree-of-Life, is multi- dimensional and should always be viewed that way, staring with the fact that 32 is 25, and that 32 represents the 32 edges (paths) of what is called in mathematics a 4-dimensional hypercube. 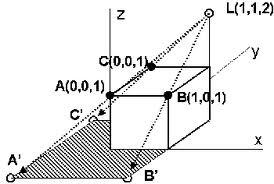 Though our modern physicists, by and large, agree with the ancient Kabbalists that the greater universe is constructed in 10 dimensions, we cannot even fathom , except mathematically, how a 4-D cube, or indeed any object would actually look. 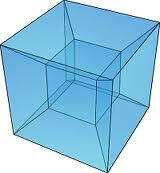 Nevertheless, in the same way that a 3-D cube casts a 2-D shadow on our desk, a 4-D hypercube does the same in our 3-D world. It’s by these shadows, much like Plato’s cave, that we can glimpse and maybe grasp that upper dimension. 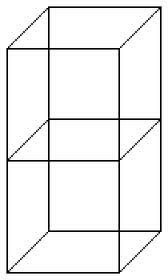 The following illustrations are just such shadows of 4-D hypercubes on our world, and the reason we need to perceive them before getting back to the temperature scales will be clear in a moment, but keep in mind that it’s only because of light that we have shadows and thus perception in the first place. One of the shapes that a 3-D cube casts on a flat 2-D page is a square, another is a hexagon, and likewise one of the shadows cast by our 4-D hypercube on our 3-D world is a cube itself (if you follow the outlines in the blue image). 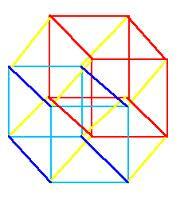 Others, include the tesseract, as in the image above (a cube within a cube), and also the double stacked cubes, which once turned on its axis, forms the exact Tree-of-Life depiction kabbalists have been elaborating on for thousands of years. 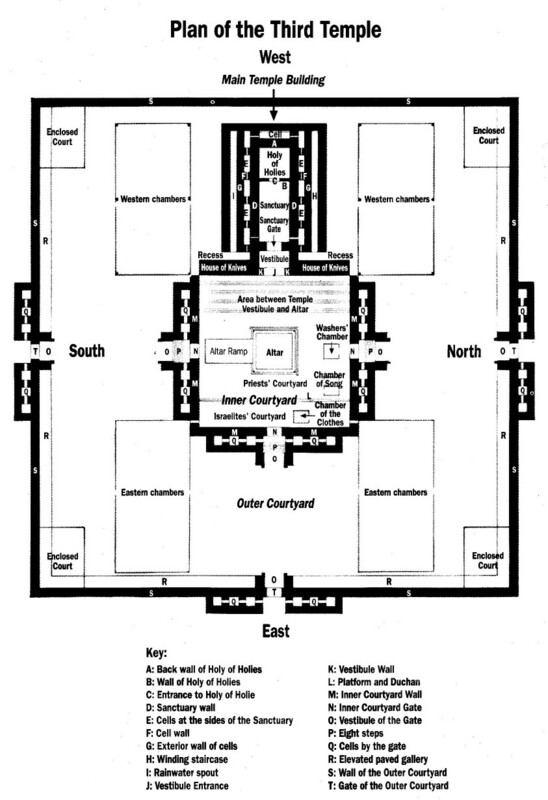 Since we have a difficult time imagining hyperspace or multiple dimensions, lets look at the simplest schematic of the Future Holy Temple’s layout, which has an outer courtyard that measures 312 x 312 cubits square, an inner courtyard centered within it that measures 100 x 100 cubits square and the Alter within that that measures 32 x 32 cubits square. There is, of course, the Holy of Holies, measuring 100 x 100 x 100, a perfect cube of 100 cubits per side that sits off to the side, and also numerous other significant structures, but today we are concerned only with the precisely centered concentric ones. The three temperature scales align such that 0 Kelvin = -273.16 degrees Celsius, and 0 degrees Celsius = 32 degrees Fahrenheit = 273.16 Kelvins, and 273.16 = half of 546.32. 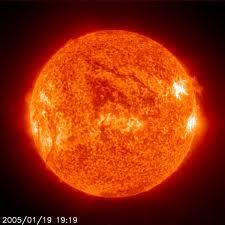 Thus from 0 Kelvin to 32 degrees Fahrenheit, there are 546.32 degrees Kelvin. This is most interesting because the number 546 is the sum of the initials of the 10 sefirot (dimensions) along the 32 Paths of the Tree-of-life. Thus, to the kabbalists, the temperature, which after all only measures energy transference, is analogous to the Tree-of-Life. Furthermore, 273 is thus the Tree-of-Life cleaved down the middle as described by Abraham 3700 hundred years ago in his Sefer Yetzirah, The Book of Formation. The energetic connection between 32 and 100 goes deeper than the results on our thermometer. According to the ancient science of gematria, each of the Hebrew letters has a numerical value representing its underlying energy and when the letters spell out a word they impart their combined energy to that word and its meaning. As is well know, the Torah begins and ends with the letter Bet and Lamed, which in gematria have the numerical value together (2 +30) of 32, and 32 squared, the area of the central Alter of the Holy Temple is 1024, or in scientific notation 210, which just happens to be the exact number of different word values in the Torah, 1024. 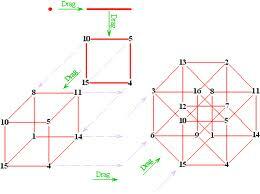 Now, what makes this especially telling is that a hypercube in the 10th dimension, as in the 10 dimensions that most of our modern physicists believe the universe to be made up of, and as in the 10 dimensions of the tree-of-life that our ancient sages and kabbalists believe the universe to be made up of, has 1024 vertices or points (corners). 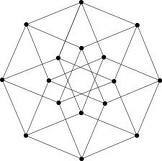 So one could view (if we had such extraordinary vision) the Torah as a matrix designed in 10 dimensional space, forming a hypercube whereby each point represented a different word value of the Torah. Now, a little more down to earth is, as we just said, the first and last letters of the Torah, Bet and Lamed, have a numerical value of 32, but they also carry an ordinal value of 14, making their complete value 46, which is that of the Hebrew word for cubit, Amah (EMH) as in the 32 cubits of the Alter. Moreover, the letters in Amah (EMH) can be rearranged to spell Me’ah (MEH), also of numerical 46, which is the Hebrew word for 100, so both cubit and 100 occupy the same vertex (point) on that 10-D hypercube and both connect directly to the point occupied by the number 32. Now, since envisioning this in a flat two dimensions would be shortsighted, and one of the secrets of the structure of the Future Holy Temple, is revealed by adding the 3 concentric central components of the Temple together. 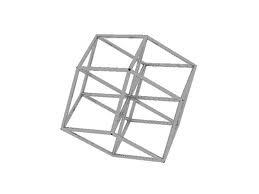 The base measure of the Alter cubed, 323 plus the measurement of the Inner Courtyard cubed, 1003 plus the Outer Courtyard cubed, 3123 = 31404096, which is precisely 31400000 plus 4 x 322, or 4 times the number of word values in the Torah, and thus in scientific notation 212. The number 314 is quickly recognizable as the mathematical constant PI, but also the numerical value of the Name of G-d Shadai (ShDY) found on every mazuza, and it is also that of the Archangel Metatron, guardian of knowledge. And when you connect this intrinsic cosmic design to the proper sequence of Holy Names, you have the flow of the Divine Life Force (the Shefa) that sustains all existence. Moreover, 312 is just 1 of the 1024 word values in the Torah, but individual words with the value 312 are found 128 times in the Torah and that is 32 x 4 times—probably not a coincidence, right? 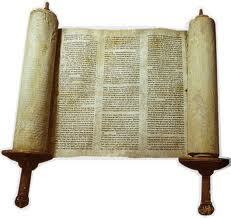 Also, the 312th word value in the Torah is 314, also found 128 or 4 x 32 times in the Torah. 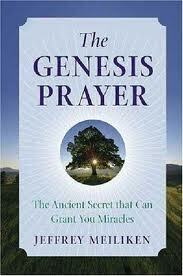 The Torah and divine structure of the universe is nothing if not awe-inspiring. 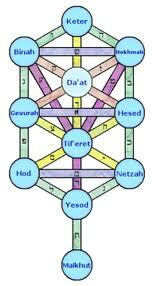 And the Future Holy Temple will be our bridge between the Tree-of-Life and our limited world of illusions. 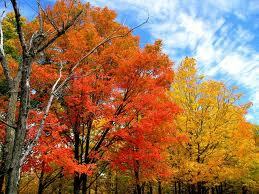 The seasons change and so do the colors. Why? 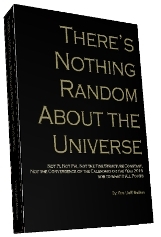 Sure, there is a scientific biological reason and it’s not really open for dispute, but there is a spiritual reason as well. Everything in our world runs in cycles, usually cycles of 7, and there is a time for everything, as in the 28 times of Ecclesiastes (3: 2-8), and depending where you live there are 4 very distinct seasons. 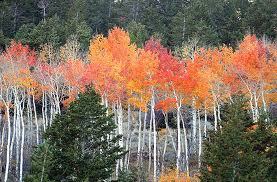 So why then the colorful change during the different seasons and why are we mentioning it in a kabbalah blog? Because color is nothing more than differing frequencies of light and light is nothing more than a stream of photos, which are energy bundles, ergo colors are just reflections of differing frequencies of energy, the same as the Hebrew letters. 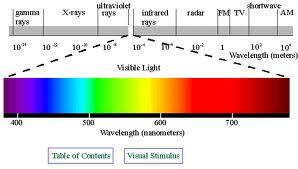 1/(210*330) = 1/69300 inches (the exact wavelength for violet light on the opposite side of the visible light spectrum). And by the way, 210 + 330 + 1 = 541, the numerical value of Israel, at the center of the visible frequency scale. Be that as it may, our world was created for us and there is meaning and purpose in everything in G-d’s Creation. Everything was put there to support us, including the colors. We actually need the energy available to us in the colors, and there is an easy way to tap into that energy. If you live in a area where the leaves change colors you especially need to tap into them before winter arrives, no different than the squirrels need to hoard acorns. Very simply, you want to spend some time outdoors, stare in he direction of whatever color pops out as brightest, and allow your eyes to soften their focus. Soon the colors will intensify. Just allow yourself to absorb them. You can do this for a few seconds, or you can doing a full meditation or Ana B’koach–all depends on your desires. 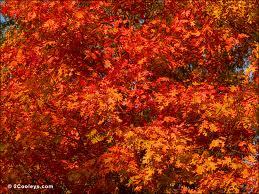 In the Fall, I’d do this with as many different colors as I could find, intense reds, yellows, oranges. Winter will be here soon. In the Spring, or in an area of perpetual green, focus on the bright light green, yellowish new growth; the energy will rejuvenate you. While hiking in the Cascade Mountains, inspired by the beauty and the waterfalls, I went a few miles too deep and had exhausted myself, with sundown fast approaching. 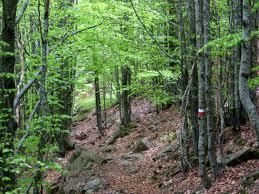 In a few seconds of soft focus, the green forest was ablaze of bright light green rejuvenating energy. And after only a couple minutes of relishing in this energy, I quickly retraced my trail and beat the sun. And by the way, the colors of sunset and sunrise, give us those bountiful same energies, just in time to begin our days, and our nights. As for the blue frequencies, we have only to look up to the sky. Take advantage and enjoy all that was given to us. We were given this world, let’s make the most of it. Getting in tune with it, is a great way to begin.